First off, Happy New Year! Weather is great, as one would expect at this time of year. No rain for ages and the breezy Northeast winds seem to be slackening, making life a bit nicer if you are heading out on a small boat. Ah yes, the rain. Everyone worries about the weather. I hope that over the last few years this blog might have helped answer some questions. The weather archive links on the left of the page should help - you can look back at the last few years and get an idea from my photos and comments just how the weather was. Low season can be wet, but often not too wet. High season can have rain too, but we are now well into the driest time of year. The months December, January and February have least rain on average. I got some great real rainfall data last year from Steen, a Danish guy who lives in Patong and has been recording rainfall since 1998. 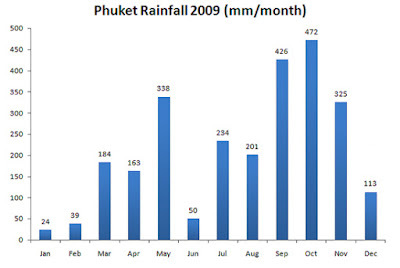 From this data I made the Phuket Rainfall Averages.... I'll update that page later including all the rainfall from 2009. Last year saw a total of 2569mm of rain (or about 100 inches). Sounds like a lot, but that's just about average for Phuket. In the last 10 years the wettest year was 2003 with 3154mm, driest year was 2005 with just 1814mm of rain (in 2005, Steen recorded just 1mm of rain during the whole of January and February). Wettest month of 2009 was October (472mm, slightly lower than the 10 year average). September was not far behind (426mm). This is normal - these are the 2 wettest months of the year. November was pretty wet too (325mm, much higher than average). We had a very dry June in 2009, just 50mm of rain recorded, the lowest since Steen began collecting data in 1998. The fact that you can get drier-than-average and wetter-than-average months just goes to show that you really cannot 100% predict the weather and it's really not worth worrying about. 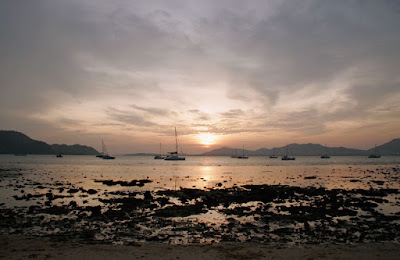 But if you want the best chance of sun, then come to Phuket NOW!